Birth of John Perks recorded September quarter 1893 at Dudley. 65 Regent Street, Woodsetton, Staffs. Joseph Perks (44, Bricklayer’s Labourer, born Wolverhampton), his wife Elizabeth (45, born Tipton), and their 6 children: William (20, Coal Miner, born Sedgley), Joseph (18, born Sedgley), George (14, Labourer, born Sedgley), Thomas (8, born Sedgley), Annie (5, born Tipton) and Mary Elizabeth (2 months, born Sedgley). Joseph Perks (52, Bricklayer’s Labourer, born Willenhall), his wife Elizabeth (52, born Bloomfield), and 4 of their surviving 7 children of 8: Joseph (27, born Woodsetton), Thomas (21, Colliery Pump Minder, born Woodsetton), John (17, Colliery Labourer, born Woodsetton), Annie (14, born Woodsetton). 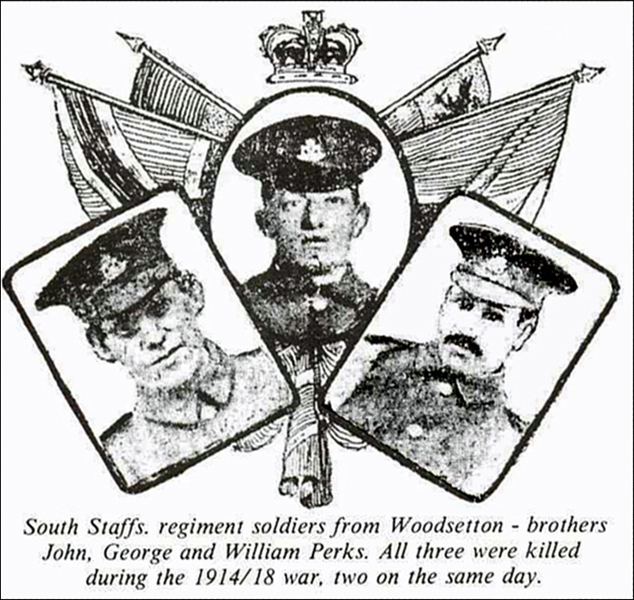 Brothers John, George and William Perks all joined the 7th South Staffs on the same day and had adjacent numbers. John still lived at home with his parents in Regent Street, Woodsetton; George and William lived in Tipton. On August 6th the 7th South Staffs took part in the landings at ‘B’ beach Suvla Bay, two days later the 7th South Staffs took part in an attack on Chocolate and Scimitar Hill which went disastrously wrong. The ‘History of the 7th South Staffs’ reports 400 casualties, this is highly likely as 118 Other Ranks and 3 Officers were killed, amongst them 3 Woodsetton men. William Perks wrote to his parents that George had been shot through the head whilst at his side. He carried George to the Red Cross and returned to the front line, George lived for a further four hours. 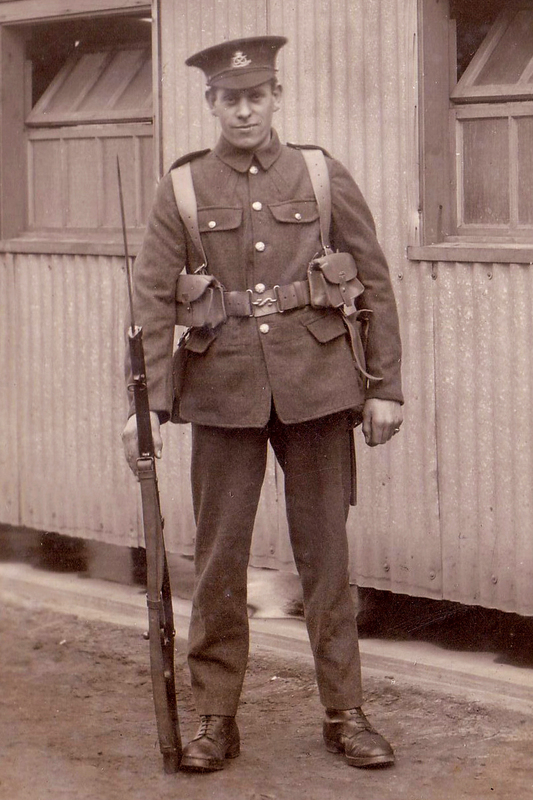 Before he reached the front again William was told that his youngest brother Jack (John) had been killed. William was also to lose his life, on 28th April 1917 during the Battle of Arras, and also has no known grave. 118 Other Ranks and 3 Officers were killed, amongst them 3 Woodsetton men: John Perks, his brother George Perks, and Abraham Braden. 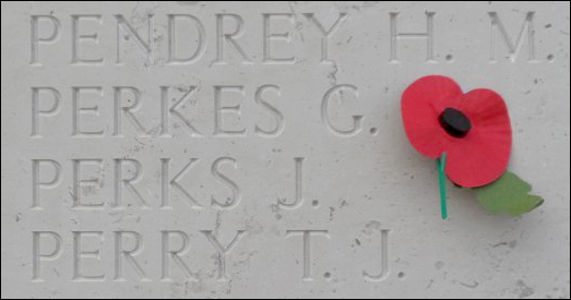 Like the majority of the men killed this day, the 3 Woodsetton men have no known grave, and are commemorated on the Helles Memorial. There can be no doubt that the 7th South Staffs Battalion (Lord Kitchener’s Army) suffered heavily in the tremendous battle at the end of the first week of August. Official notices of scores of deaths of our brave local lads in that wonderful conflict have been received by the relatives during the past few days. In one case two brothers were killed on the same day, and it is noteworthy that together with a third brother who was in the same battle, they had enlisted on the same day. They are the sons of Mr and Mrs Perkes of 65 Regent Street, Swan Village, Woodsetton, Coseley. Their two sons who are killed are George Perkes, aged 28 (married), who resided with his wife in Canal Street, Tipton. He was employed as a collier at the Park Lane Pits up to the outbreak of war. The other brother, who worked at the same colliery, is John Perkes (single), aged 22, who lived with his parents, and was the mainstay of the home. The father is quite unable to work, being an absolute invalid from chronic asthma. Both brave young heroes threw up their work and joined the 7th South Staffordshire Battalion, together with an older brother, on November 4th last. All three were in the same battalion, and left England about a couple of months ago. The youngest had sent many postcards home to his mother while he had been training in England, and these mementos are much treasured by her.